Warsaw, Poland… 1941 – Wladyslaw Bartoszewski was seventeen in 1939 when the Germans invaded Poland. He participated in the defense of Warsaw and was arrested on September 19, 1940, and sent to Auschwitz. Released in 1941, he joined the Polish underground known as the Home Army or the AK. He also belonged to the Catholic underground organization Front for the Rebirth of Poland. 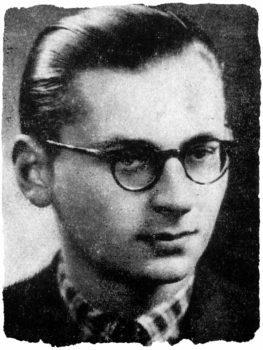 Wladyslaw Bartoszewski was chosen as a member of the Delegatura, the representative body in Poland of the Polish government-in-exile. As a member of the Delegatura, Wladyslaw Bartoszewski was a leader of Zegota, the Council for the Aid to Jews. Zegota was responsible for saving several thousand Jews and, according to one estimate, 40,000 to 50,000 Jews benefited in some way from its activities. Bartoszewski worked for the freedom of the Jews as well as Poles. From August 1 until October 2, 1944, he participated in the Warsaw Uprising. He was then a member of the Bureau for Information and Propaganda of the Central Headquarters of the Home Army. Wladyslaw Bartoszewski transmitted reports on Nazi terror and the situation of the Jews to the Polish government-in-exile. Following the war, Bartoszewski was imprisoned by the Polish government for eight years (1946 to 1954). In 1965 he was recognized as a Righteous Among the Nations by Yad Vashem, making him one of the first non-Jews recognized by the State of Israel. He served as Poland’s ambassador to Austria from 1990 to 1995 and also served as Poland’s Minister of Foreign Affairs. In 1990 he was appointed Chairman of the International Council of the Auschwitz-Birkenau State Museum. Wladyslaw Bartoszewski passed away in 2014.